After recently activating my 30 day free Netflix trial, I've become obsessed with watching my favourite TV shows and films on Netflix. I noticed Annie, from 'Annie Writes Beauty', created 'The Netflix Tag' this month and I found the questions she made really interesting and fun. I'm actually planning on doing a more genre-specific Netflix post in the near-future, but as I'm still fairly new to Netflix, I thought I'd start off with completing 'The Netflix Tag'. 1. 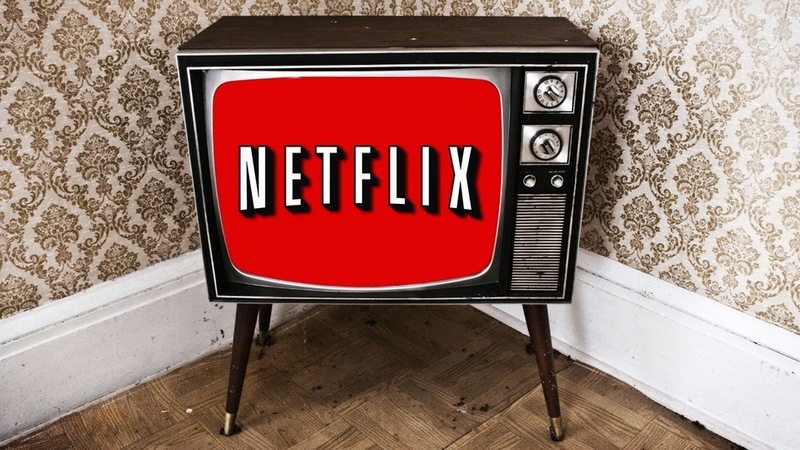 What are your favourite series' to watch on Netflix? Definitely 'American Horror story'. I have a love-hate relationship with the different seasons though; I loved 'Murder House' and 'Coven', but I didn't like 'Asylum' so much. I've also revisited some episodes of 'The Inbetweeners', 'The Undateables' and 'Human Planet' - all are amazing! I've recently become obsessed with watching 'The Vampire Diaries'. I've managed to watch a season and a half in just over a month and I absolutely love it. As the story line is a little bit slow currently on the 'Vampire Diaries', I've started to alternate a episode with an episode of 'Suits', which I've become newly obsessed with. 'Catfish: The TV Show'. Although I have watched every episode online, I still like to revisit some of the best episodes. I also wish they had 'The Simpsons' on there - I own every box set apart from the last 6 seasons, which I watch occasionally on Channel Four. I hate how Netflix rarely have a whole movie series. After watching 'Saw' a couple of weeks ago, I wanted to watch the second movie - every other movie in the sequel was there apart from the second one! 'Blackfish' - believe the hype! Feel free to complete this tag on your own blog! What are your favourite series/films to watch on Netflix? I've started to make more of an effort with my hair recently. When I was 16, I discovered my hair actually looks perfectly fine au naturale without attacking it with heat tools 24/7. Since then, I've barely picked up another heat tool. 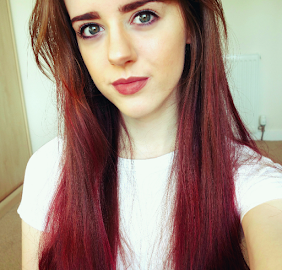 Now my hair is in better condition, I've slowly started to introduce heat tools into my hair styling regime again and I'm loving it. Anyone remember the Mary Kate and Ashley hair curling tools? I remember LOVING them when I was younger, but then later realised how bad a job it did at curling my hair. The bottom half of my hair would be curly (not the top, my hair was too long to fit around the barrel) and I would have kinks at the ends of my hair from the clamp - not a good look. Nowadays, I swear by my BaByliss Pro Curling Wand. I thought the transition between a hair curler with a clap to a clamp less one would be difficult, but it's definitely one of the best decisions I've made. 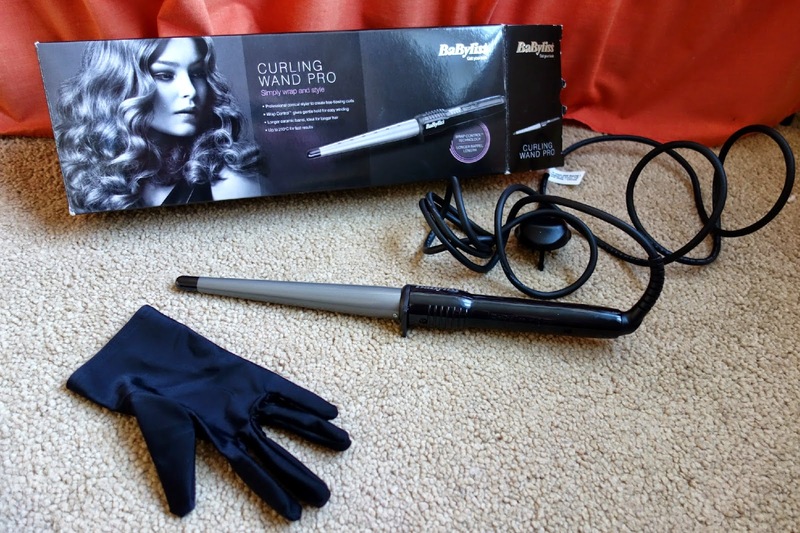 The wand is extremely easy to use and does the job of curling my hair in about a quarter the amount of time it would take with my old Mary Kate and Ashley curler. I bought last Summer for only £24.99 at Boots. There are four heat option settings: 165, 180, 195 and 210 degrees. 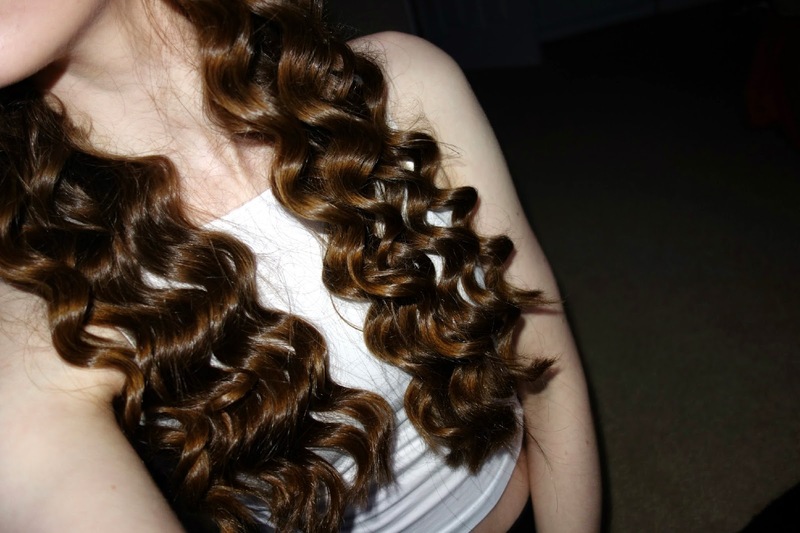 I tend to opt for the highest setting if I want to quickly create really tight curls. If I'm only wanting subtle waves, I'll stick to the 165 degree option. Remember to always use a heat protectant before using hot tools on your hair! The device takes about 30 seconds to heat up and you're ready to go! The curling wand came with a heat protection glove. The glove does protect against heat quite well, but obviously don't hold your hand/fingers on the metal plate for too long as they are still very, very hot! I tend to have my curls going away from my face, so I'll have curls directing towards the left on my left side, and right on my right side. Amazingly, the length of my hair manages to wrap itself comfortably around the barrel. 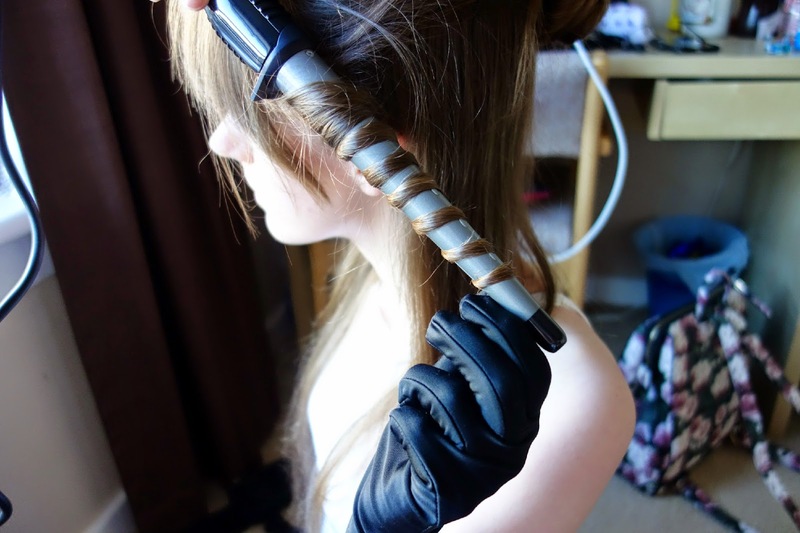 I only need to hold my hair in place at the end of the barrel for around 10 seconds. If I'm wanting tighter curls, I'll hold it in place for a couple of seconds longer. As you can see, my hair is very long and curling it does take a few inches off the ends! For the purpose of this blog post, I tried to make my curls really tight so you could see the full effect of the curling wand. After curling, I would lightly brush them out with a comb and apply some hairspray to keep the curls in place. I often tend to leave my curls quite tight on the first day, and by the second day they look more voluminous and natural. 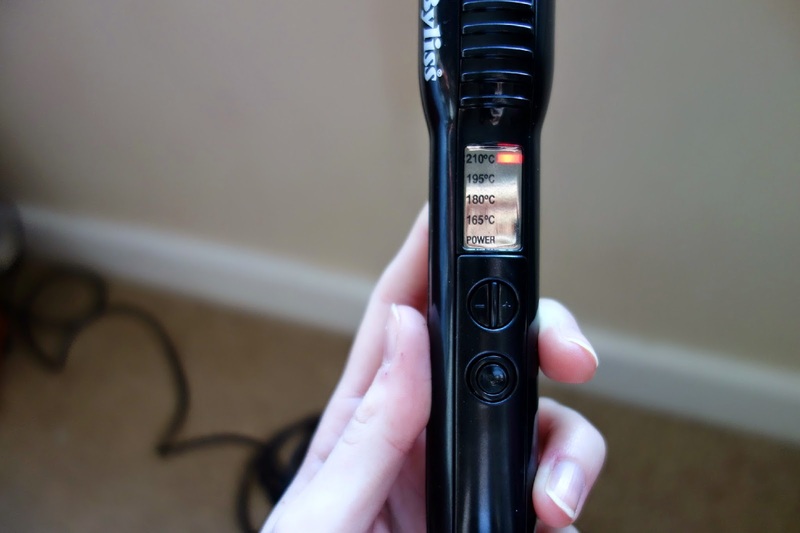 What is your go-to hair styling appliance? Have you tried any BaByliss products? Happy New Year everyone! I hope you are all well. My Christmas holidays are almost at an end, as I go back to University on Monday. But before that, I'm going away for a final getaway this weekend before my exams start and my hectic University life starts again for another semester. I'm flying down to Essex this weekend to visit my family, so I thought I would show you what I'm carrying with me in my weekend rucksack. We decided to fly with only hang luggage, so it has definitely been a challenge for me to cut down on what I pack. As I'm flying to Essex, I've had to condense a lot of my beauty products into smaller containers as liquids are only permitted in hand luggage at a quantity of less than 100ml. 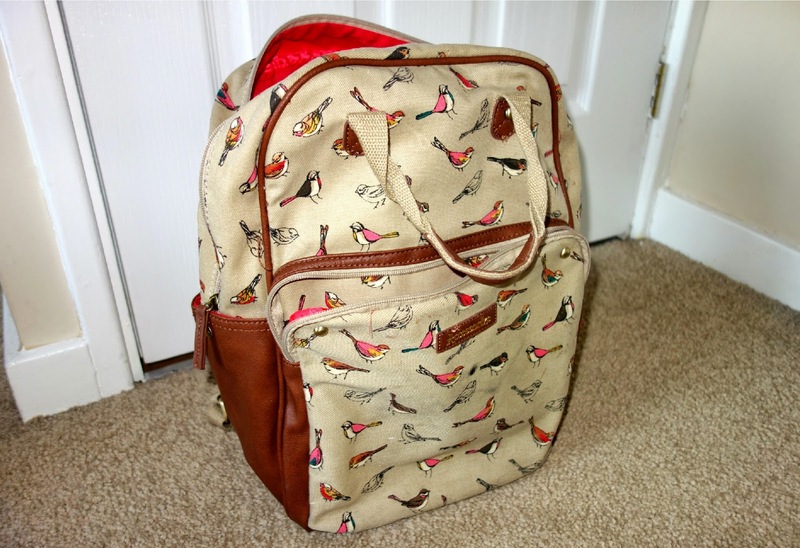 This is the rucksack I'm taking with me for the weekend. I received it as a gift last year and it's actually the rucksack I took to University every day in first year. Since then, I've found a smaller rucksack, but this is the first one I would reach for if I was going away for the weekend. 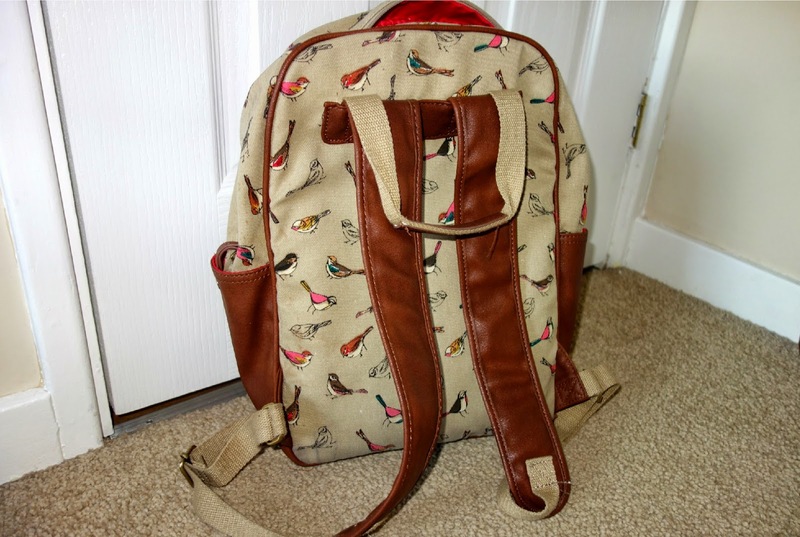 It's from Accessorise and has a main compartment, a smaller compartment at the front and also two more compartments at the side of the rucksack. It's really comfortable to carry on my back as the straps are soft and don't dig into my shoulders. I have a selection of outfits I'm taking with me this weekend. I'm mainly taking casual clothing, as this weekend will mainly be spent catching up with family. However, on Saturday night, my Uncle is having a gathering for his 50th birthday, so I'm wanting to dress quite smart. Please help me pick an outfit for Saturday night from the selection I'm packing! I'm planning on wearing this outfit on the plane. I get quite cold on the plane and once we land, we're driving to my Grandparents house, which is about an hour away from the airport, so I want to be comfy. I picked up this grey sweatshirt from H&M last week and it's definitely my go-to jumper just now as it's so comfortable. I would pair this with my denim Topshop Joni jeans. I'll be wearing my black heeled boots from Matalan for the whole weekend as they look smart, but are also comfortable to walk in too. This outfit is a possibility for my Uncle's gathering on Saturday night. My black and white striped bardot top is from Miss Selfridge and sits just off my shoulders. 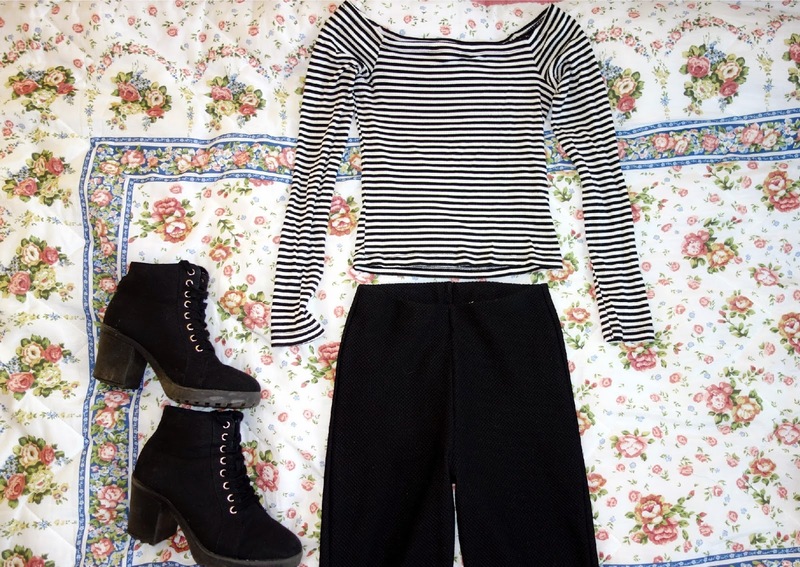 I'd pair this with black high waisted trousers, also from Miss Selfridge, and my black heeled boots. I've also packed my grey swing dress from New Look. I find the shape of this dress is really flattering and is my go-to winter dress as it has long sleeves and a small turtle neck. I would wear this with black tights and my black heeled boots. 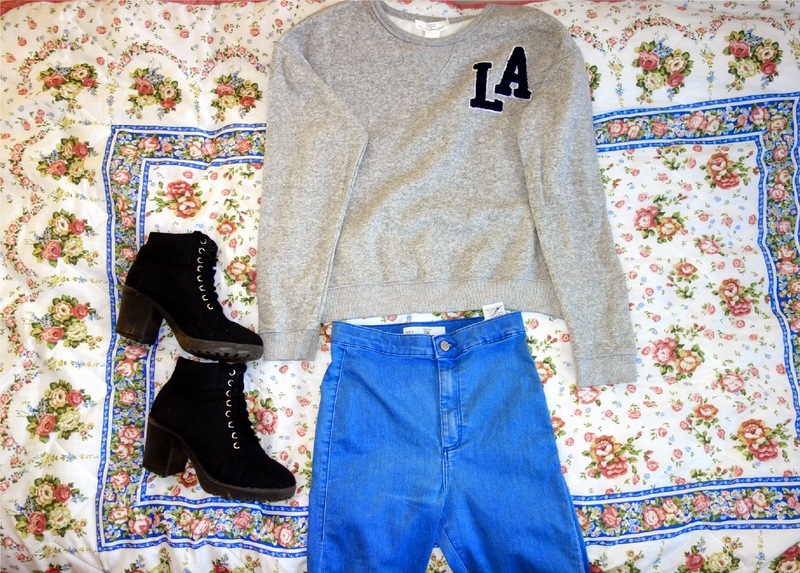 I'm obsessed with this outfit at the moment. 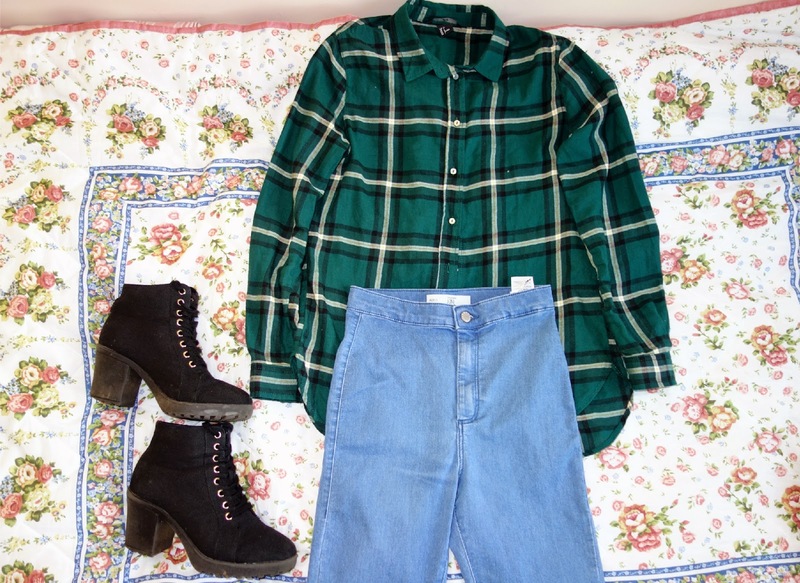 I love wearing shirts and I found a green plaid shirt in H&M last week for only £20. I don't own a lot of green clothing items, but I've discovered it really compliments my dark brown hair. Along with the shirt, I would wear my denim Joni jeans and my black heeled boots. 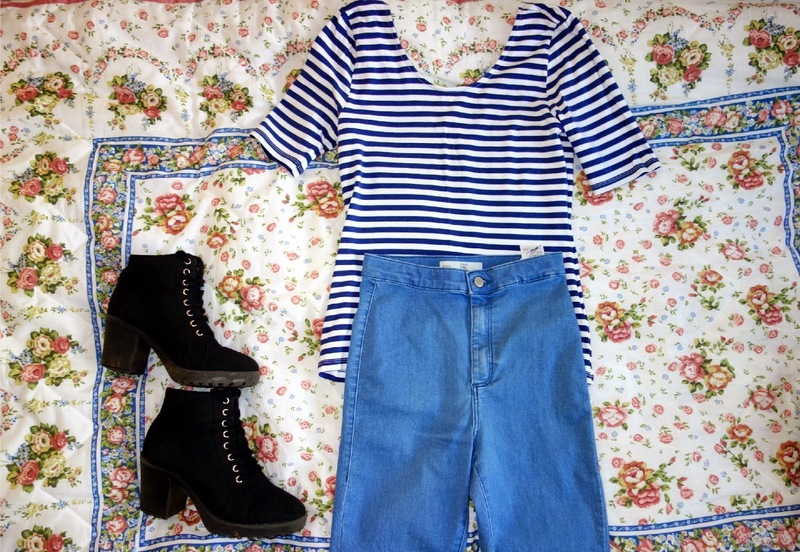 When I was shopping in H&M last week, I also picked up a blue and white striped tshirt for £3 in the sale. The top is a little bit big for me as they didn't have my size, but it is well worth the small investment. Again, I would pair this with my Joni jeans and black heeled boots. 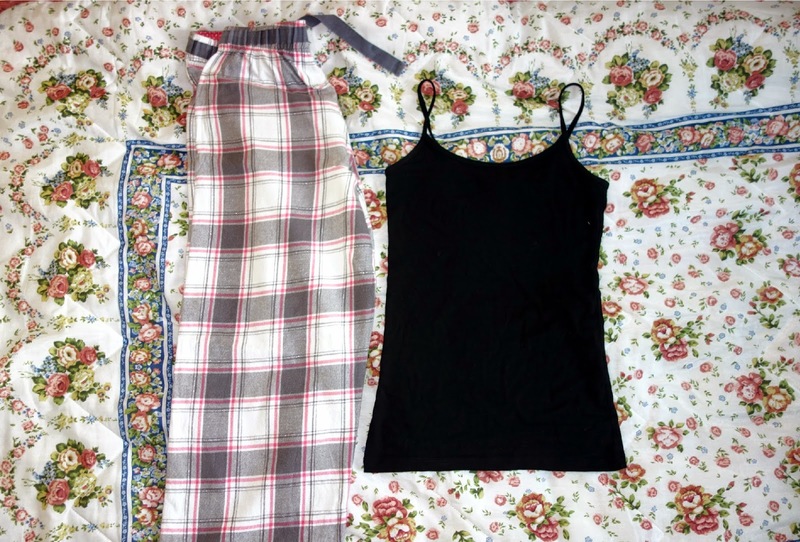 I'm only taking one pair of pyjamas for the duration of my stay in Essex. I got these long pyjama trousers for Christmas a couple of years ago, I believe they are from F&F at Tesco. I'll also be wearing a simple black vest top from Forever 21. I've managed to pack all my toiletries into a small travel bag from Lynx. 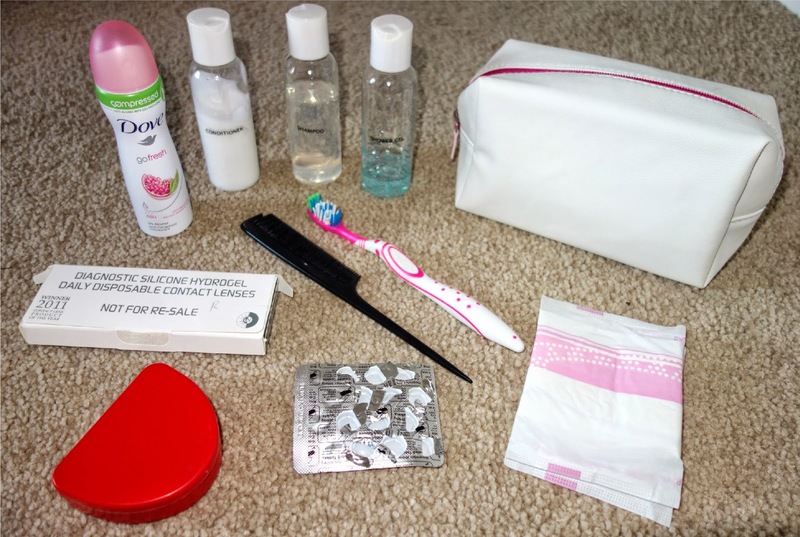 I'm taking a Dove Go Fresh Deodorant, toothbrush, a comb, contact lenses, dental retainers, sanitary towels and painkillers in case of emergencies or if I'm feeling unwell. I have also made mini bottles of shampoo, conditioner and my face wash to last me the weekend. I purchased a travel kit from Primark last year for about £1 which included three small travel size bottles. 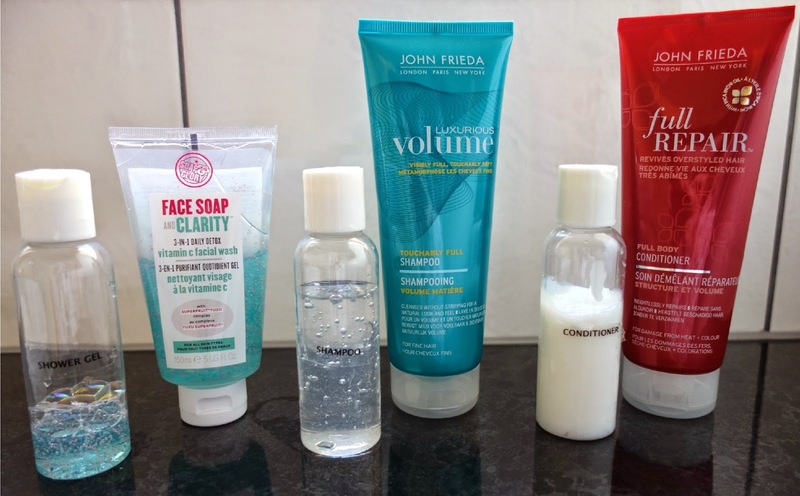 I squeezed some of my face wash (Soap and Glory 3-in-1 Daily Detox), shampoo (John Frieda Luxurious Volume) and conditioner (John Frieda Full Repair) into the bottles. If I don't manage to use up all of the product this weekend, I'll continue to use them when I arrive back home. I thought I would rather squeeze out too much than not have enough product. As for shower gel, I'll use whatever is in my grand parent's bathroom. 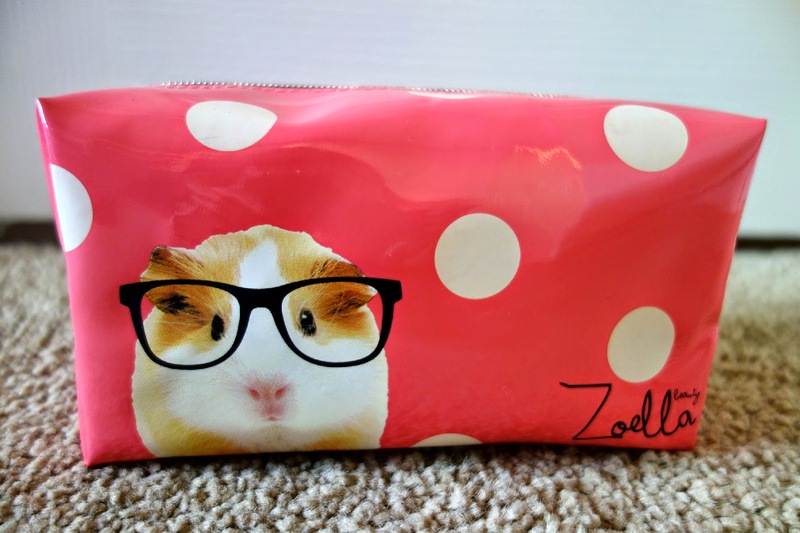 I have packed my makeup in my Zoella beauty cosmetic bag. 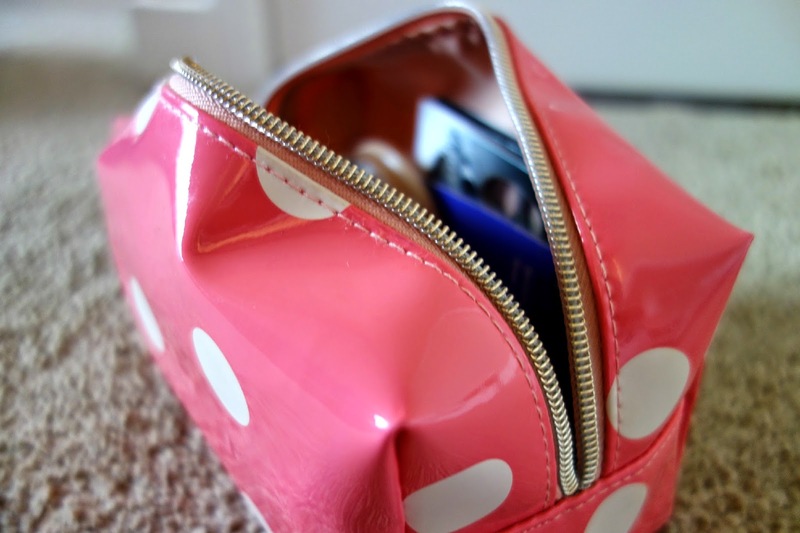 The bag is big enough to fit all my every day beauty products inside. I'm not going to show you what make up is inside just yet, as I have a separate blog post planned where I will go into depth about my every day make up products. I actually have an exam next week, so unfortunately I have to take some study equipment with me. 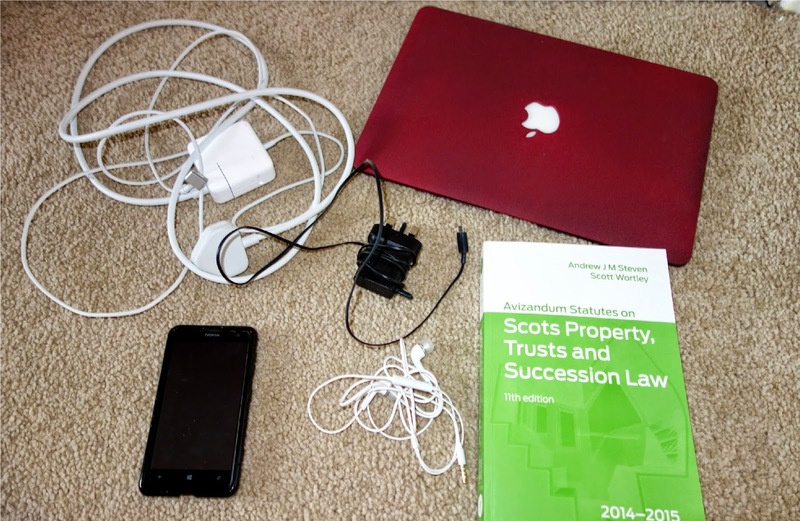 I'll be taking my Macbook Air, a statute textbook, earphones, my Nokia Lumia 625 and some electrical chargers. 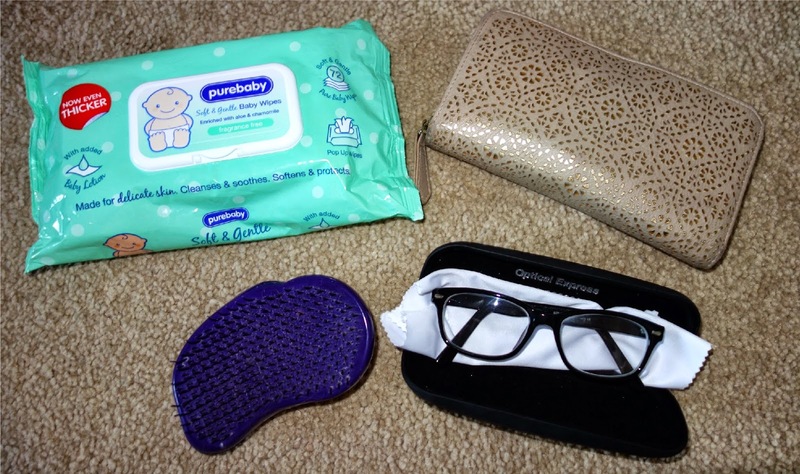 Some other miscellaneous items I'll be taking with me include some make up remover wipes, my purse, a tangle teezer and my glasses. I hope you enjoyed this blog post. Let me know which outfit you think I should wear for my Uncle's 50th gathering on Saturday night! 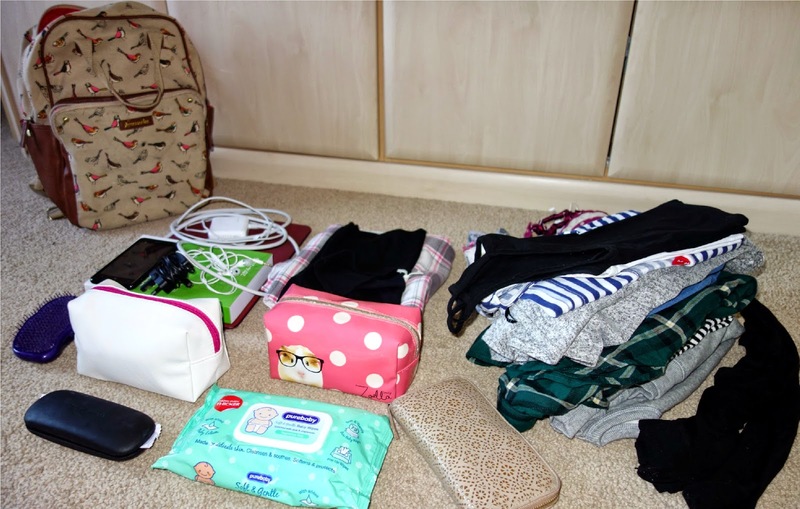 What would be your essential items for a weekend away if you were only allowed to carry hand luggage?